This post is written by me from a reader’s point of view- after seeing how many blogs who had once been popular started to lose its readers. Before I actively began blogging, I have been reading many blogs. This post is not really about losing new readers because a person who loses streams of existing readers will probably not be successful in getting new ones. From years of being a blogger and following popular blogs, I have seen a number of popular blogs loses their readers because of certain mistakes that they made. All successful bloggers would have started off from very humble beginnings. When the blog first began, the blogger is probably humble, down to earth and writes tonnes of good materials with great value to the visitor. Every visitor who comes felt there is something very valuable that the visitor can take with him/her after visiting the blog. First time visitors will spend hours just going through the archives to ‘catch-up’ on past articles writen by the blogger. The blogger is also very responsive and will reply to comment threads by any new visitor, making the visitor felt welcomed (either the blogger does it via the comments thread or send a personal email to the reader). This make all new readers coming back and becoming loyal visitors. It does not take long for the popularity of the blog to quickly grow- and the blog quickly become listed at the top searches in search engines. Loyal readers help spread the words around to their friends- who also soon become loyal visitors. The blogger watched as the traffic growth happens exponentially. Then somewhere, somehow along the line, the popularity growth got into the blogger. Fame can sometimes really changes the person- transforming the person into a vain, proud, obnoxious and snobbish. Readers will not have known about it had those traits did not show up in the writing. It shows- when the message in posts are centered around “me, me and ME” and no longer “you”. Sometimes, every single post is either used as self promotion or trying to shove some products on their readers’ face. There is no more passion to write good posts- the reader could see that the blogger is turning the blog into a money making machine. Hey, it’s perfectly fine if the blogger wants to monetise the blog- most readers are cool with it- in fact, readers will support it because they want the blogger to be around with good articles. At least the blogger gets some money back to at least cover the expensive hosting fee- the more visitors to the blog, the more the blogger had to pay for good hosting service to increase the bandwidth. But if the blogger wants to monetise the blog, do it at the sidebars- or as picture inserts in between the posts. Please do not use the entire post contents to brag about a product/program, how good it is, blah blah- it will look obvious that the blogger is doing a highly paid review. Again, please don’t misunderstand my meaning- a lot of popular bloggers do product reviews- but they are upfront bout it and they state the good as well as the bad points of the product. Because the blogger has also his/her reputation to protect- it is the reputation that earned the blogger loyal readers. But avoid doing product reviews at every post or alternate posts- normally readers don’t like that. What turns readers off is that being humble and down to earth and later change to egoistical and obnoxious- loyal readers will find it hard to accept that. The blogger may think that it is smart to outsource their writing by accepting guest posts. Of course being a blog of high authority, many aspiring bloggers would write long articles for free in exchange for a link back to their site. Once a blog has nothing but guest posts, the blog would definitely lose its popularity. What the blogger don’t understand is loyal readers are coming to the blog to read what the blogger has to say. Often they are not interested in strange and often unworkable ideas written by an unfamiliar name. When the blog starts to contain nothing but guest posts, you can gauge that the blog is slowly losing its popularity when the comments started dipping from above 100 comments to less than 10 comments over a span of time. Of course, there are blogs that do well with the occasional guest posts but the author of the post must be carefully screen and selected. If before, the blogger has been writing about certain aspect of their lives- say for instance- about being single. The blogger would have attracted a group of people who are in the same shoes- ie singles. There will be active interaction because the blogger and majority of his/her visitors shared one thing in common. Then, a few months later, the blogger fell in love. And the blog posts started to change – almost every single post is dedicated to the new love- the blogger even opening professes his/her love. What do you think happen to all those single and lonely readers? Well, they’ll feel left out- they will probably write on a few comments page to congratulate the blogger, etc and then….its chiao to other blogs. It’s the price the blogger would have to pay- bloggers will normally know it is the price to pay. But in other instances, the blogger may also gain readers when the blog provides what a new segment of readers are looking for provided the blogger know how to reposition the focus of the blog. Example, a site may started off as a diary of daily musings- then later the blogger develop an interest in computer games and use the site to review computer games. So, the blogger would lose readers who are not into computer games but gained those who are crazy about the games (probably even more readers). This can be done through careful refocus of the blog’s branding- but it takes a bit of time. Let’s say you went to your good friend’s birthday party. Now, you below to the lower economic class and your good friend is very rich. So you don’t have money to buy expensive clothes and you look very out of place in the party. You already feel awkard enough, but to add on, your good friend sort of ignored you and act like you don’t exist. It’s almost she was ashamed to be seen with you. Wouldn’t you feel hurt by that, especially if your friend had known you longer than those other fellas? And will your opinion of your friend change after that? Will you find yourself slowly distancing away from that friend. Of course, you will probably give a few chances to your friend but once you noticed that your friend had changed, you will learn to get over it and move on…. On the other hand, when everyone’s talking to your friend, your friend still make time for you. She apologised for being busy and try to introduce you to new friends who share similar interests. Don’t you feel touched that despite being a busy hostess, your actually matters to her? If you understand this, surely you will understand the feelings of a blog’s followers. If the blogger ignores comments by loyal visitors, never respond to emails, after a while, the readers will find another better blog to go to. It’s perfectly alright if the blog owner make it known that he/she does not actively participate in comments from the start. If the average post gets more than 100 comments, it is hard for the blogger to keep up. Loyal readers will be forgiving about that because they have gotten used to the style of the blogger. They will rather the blogger spend time in delivering great contents. Most of the time, the visitors have a great time taking over the comments page- so a blog post is followed immediately by a mini forum at the comments column. But problem arise when the blogger who maintains a strong level of interaction with readers, suddenly stop responding to questions by its readers- suddenly stop being interested in what the reader had to say. Remember, no blog will have the best content for everything- there is always another blog that will be able to fill into the needs of the visitors. But visitors chose to be loyal visitors because of the bond that had been built over time. Again, I want to stress that losing loyal visitors normally does not happen overnight. Loyal visitors will probably stick around for months hoping to see the blogger come to his senses. They will wait patiently for new posts and hope that they will once read the post from the blogger that they have knew. This is what happens if the blogger builts loyal readership who had been following the blog for at least about a year or so. The visitors don’t stop coming immediately when they see the first 2 or 3 obnoxious posts- they will hang around until they decide, ‘that’s it, I am not taking this $%#@ anymore!‘ and move on to other blogs. Many returning visitors will be familiar with how often the blogger posted on the blog whether it is daily, alternate day, twice a week or once a week. Therefore if the blogger is used to come up with only one sensational post only every Wednesday, it is alright with the readers. But if the Wednesday come and no new post, then the next Wedesday also none, and it drags on to about almost 2 months- then only finally the blogger post, then consistency is lost. The blogger is sending out a message that he is no longer interested in his blog or his readers. So what is there to stick around for? If you go through the archives of popular blogs- you will notice that initially, the posting frequency of the blogger is almost daily. Posting almost daily sets an expectation and it is very difficult to keep up with the momentum in the long run. After a while, the blogger will probably suffer from burnout, ran out of ideas or loses interest (if you keep doing the same thing every day, eventually, you’ll get sick of it). Therefore, an experienced blogger should learn to anticipate periods of burnout, holidays, no idea to write- and learn to write and schedule posts in advance. A mistake some bloggers make is to be so inspired and they can post up to 5 well writen articles in a day, only to go 2 weeks without another article. Keeping up to consistent posting frequency is important. It is ok to lapse and tell your readers you are going to that once a year vacation- but if you keep going MIA (missing in action) for long periods, readers don’t know what to expect anymore. I see many popular blogs losing readers because the posting frequency is no longer consistent. The wise thing to do will be to write those 5 articles, and spread out the articles and schedule the posting within the blogger’s posting frequency. WordPress and blogger both have options to schedule posts in advance- you can write about 2 weeks worth of post and schedule them, then go for holidays. And the programs will take care of the posting for you. Another way is to get guest writers- if your blog is popular, many aspiring bloggers who write great articles will love to be a guest blogger. You can invite guest bloggers and get them to post. Or you can pay good writers to write posts for you. Majority of successful bloggers take the trouble to host their blogs on reputable hosting companies. Each time a visitor visits a blog, the visitor’s browser will download the contents of the blog- and that requires bandwidth. So if you have 1000 visitors going into your blog at the same time, and if you are using free or cheap hosting, most of those visitors will not be able to view your site. Someone has to pay for the bandwidth and if you are hosting your site on a free blogger platform (such as Blogger, Typepad or WordPress), you have to be prepared that your site may not be able to load when you get a spike of visitors (like after you publish a new post and notify via RSS and all your loyal visitors started accessing your site at the same time). I learnt about this issue in my earlier days when one of the visitors emailed me after he could not get on my Yahoo website because of bandwidth restriction- and he was a returning visitor. He had been trying for a few days. Basically I just built the site (it was not a blog) and I don’t check on it. I had about 16 pages on Yahoo with lots of graphics and each page gets about 200 hits per day per page- before Yahoo implemented the bandwidth restriction. Needless to say, I took off the graphics and migrated from Yahoo Geocities to Blogger in 2006 (and now I migrate to my own paid hosting). Steve Pavlina – a site that everyone visits because he writes quality articles on personal development- pays about USD149 per month for hosting because he gets massive of visitors at every moment. For most of us, we may not need to pay that much for hosting but we have to make sure that the site is up most of the time and can withstand traffic spikes. Because sometimes if you write a good article and someone submits it to social bookmarking sites like Digg & StumbleUpon, you can get like thousands of hits concurrently- that is enough to crash your bandwidth and most visitors will see the message: “this page cannot be displayed”. That is bad news for any blog. There are very popular bloggers operating from Blogger platform but I think they will be operating at a disadvantage and not a full potential. Take for instance, Xiaxue who is very popular in Malaysia and Singapore-she uses Blogspot. 25% of the time, the page does not load. Another 50% of the time, the loading is slow and takes more than a minute (because her page has lots of pictures and graphics). In the end, out of 10 times I key in her url, I only ended up going in 2.5 times because that’s the only time I managed to get the page loaded. The rest of the time I will either hit the “Back” button to go to another site. Whereas, if I were to visit the top blogs, the page loads quickly all the time. If she had started on her own domain name, she will be making much more money that she does now because the frequency of returning loyal visitors are high and she will also attract tonnes of new visitors who will not be denied of viewing her site because of ‘exceeded bandwidth’. That is why if you have long term plans for your blog and wants it to reach wider audience, you have to get your own domain name and paid hosting. Don’t do it when your blog is popular because if you migrate your blog then, you will need time to rebuilt your traffic again because you will not find the search engine listing you initially. As I mention, this article is based on keeping loyal visitors. Site layout is important to attract first time visitors but becomes secondary when a blogger already have loyal readers. Layout is quite a subjective thing- whether it is 2 or 3 columns, whatever colour schemes (so long as the fonts are not too small or in red with a neon background and the post can be read easily), readers will normally accept your preference. It is after all, your blog and you have the right to personalise it according to your taste. Some popular blogs only uses very simple layout- and yet readers keep coming back because of the content. Nowadays, many bloggers are moving to simplier layouts to reduce the page loading time. I love to visit blogs that have a complete archive- ie they give a full list of articles- by the name of the post. Some popular sites only have the archives by categories and months and I find myself having to click “previous entries” many times just to find an article that I remembered I had read before. Normally, readers are very appreciative when they can easily find the articles when going through the complete article listing. You will be surprised how many visitors check the archives- even returning visitors. Don’t make it hard for them to find your past articles- having a search box is great but many visitors may not key in the correct keywords. The blog should be navigated easily and the blogger should highlight his/her best posts by listing it on the navigation bar (either on the side or at the bottom of the page). Also, “Archives”, Site map or “About” page are easily seen. When the blogger builts the navigation- the blogger put himself/herself in the readers shoes- what will make it easier for the readers. Even in very popular blogs that I go to, I always wished the blogger would make it easier for me to navigate. Most bloggers or net surfers have at least about 20 sites that they frequently visit. And each one of them would have commented at a number of blogs. Even if they go to the same blog- they may comment on 4 or 5 different posts. And the best way to engage visitor is via the comments box. 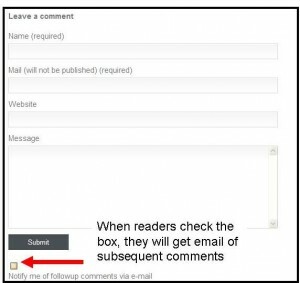 WordPress has this popular comments plugin that enable the commenter to be notified of future posts. 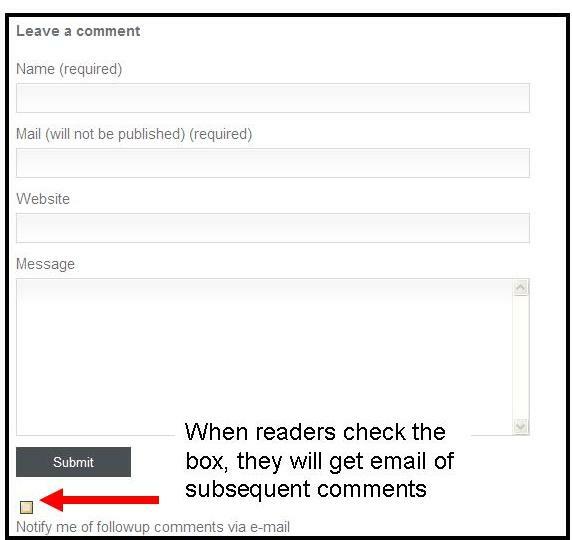 So if you were to comment on a post and click on “Notify me of follow up comments via email”, the next time someone comments on it, you will get email notification. Bloggers cannot expect visitors to keep coming back and click on the page to see the future comments- so, it will be wise to install the plugin. If the visitors are the type who don’t like to receive emails, they can always choose not to tick the box. That one of the beauty of the WordPress- and I returned much more frequently to blogs that have that function- because I get follow up comments. Sometimes another visitor responded to what I have said or sometimes I want to express my views on someone else’s comments. Unfortunately, to date, Blogspot Blogger still did not develop the feature despite so many requests, feedback and complaints from bloggers. Not only that, the Blogspot comment puts a visitor through many extra steps (such as word verification) to leave a message on it. The format made some inexperienced readers thought that they actually need to sign up a blogger account just to drop a comment (even though they don’t have to). In the long run, more and more blogspot users will migrate to WordPress- many had migrated solely because of this reason. Popular bloggers who rose from obsurity to fame and make the mistakes above will not lose most of their loyal readers overnight. Loyal visitors actually hang around and hope that things will return to what it used to be. But if that is not coming, the visitors will just move on to another blog. There’s always going to be another better or substitude blog, as no blog is indespensible- every blogger should always keep this in mind. We go through many life cycles- a blogger who is enjoys blogging may move on to greener pastures or new phrase of life (getting married, migrating, having kids, starting a new company, develop new interest, etc). We may not be blogging forever- of if we do, topics and focus will change and evolve over time. If the blogger is so busy with other aspects of his/her personal life that there is no more time/interest to write, the blogger should consider selling the site instead of watching the traffic dwindle all the way down to drain. A blog that has been built up in terms of search engine rankings, popularity can easily acquire buyers who are willing to pay a high price for it. If you don’t want to look after your blog, get someone else will would. It’s like your pet, you keep and nurture the pet- if one day, you don’t have time to look after it, do it a favour and give or sell it to someone else who would- instead of letting it starve to death (my apologies for such dramatic simile).